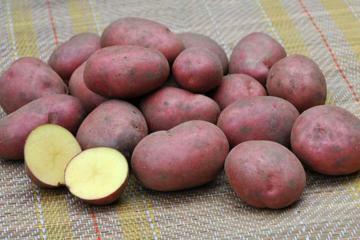 Early Maincrop variety, producing oval, red-skinned tubers with pink eyes. Pale yellow, dry, floury flesh with a good flavour. Most fertile, well cultivated soils but dislikes very wet or heavy clay soil. Prefers a slightly acid rich soil with plenty of organic matter, the tubers can be subject to scab on limy, sandy or gravely soils or those deficient in humus. Likes a sunny position. Culinary vegetable. Good general use potato.